Tourism- the word itself strikes many a chord when it comes to the levels of excitement associated. The plain fact of it being something we associate with exploration apart, it is a sector that has much to be written, spoken, and understood about. What is it that keeps it thriving day in, day out? What keeps the excitement levels up and running? Is it really as lucrative as it looks? What are the challenges it is currently facing? How does it run? To know this and more, pick up the latest issue of Samvad and lose yourself in the intricacies of a sector that just refuses to die down- “Tourism”. The Indian Tourism Industry, apart from being a major contributor to the GDP of the country, is a massive employment generator, along with being interlinked with other sectors. A sector of this importance has prompted forays of both the government and private players into itself. 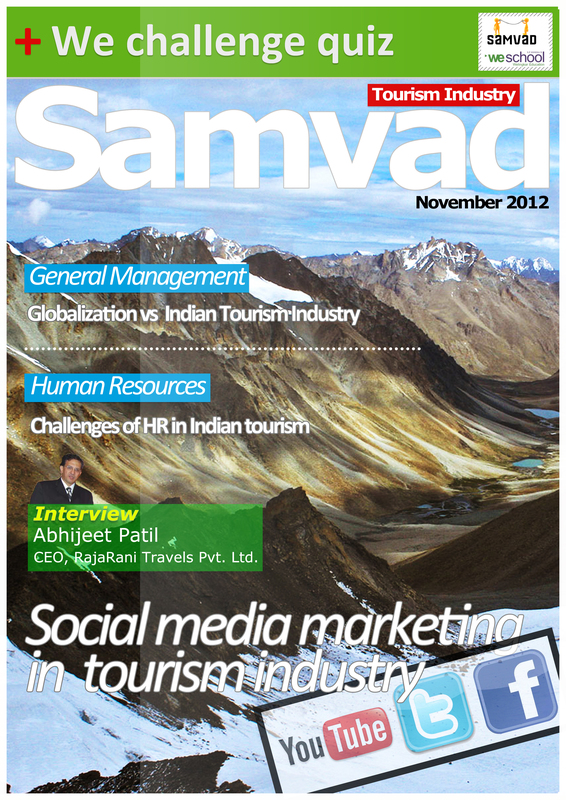 In this issue of Samvad, we discuss this and much more. You shall read about the challenges the industry faces in putting across an image that doesn’t exactly mean clarity to the customers, along with some real-world examples that we can learn from. The role of social media in aiding this process, too, appears in a separate article. Also, the trends that are currently doing the rounds of the industry have been featured that promise to open your mind to deep insights. The interlinking of this sector with another booming one: that of Medicine is outlined in a write-up on Medical Tourism. Read about the effect of tourism on the country’s economy, along with an exciting article on Tourist Stocks. Budding entrepreneurs looking forward to a foray in this sector can now trust Samvad! Pick up tips on a successful career in tourism. Learn about the value chain in e-tourism. It is impossible to stop the steady upshot of the sector in the age where everything is everywhere- read about the connection between the sector and globalization as the writers take you through a journey since the first signs of the phenomenon were felt to the present day. Read about the change in the branding of the country from the point of view of tourism. The issue features an interview with Mr. Abhijeet Patil who speaks candidly about the tourism industry and its current trends. We as a part of Samvad believe in nurturing strong relations with our readers who never let us down with their tremendous levels of interest in the magazine. The WeChallenge section, exclusively meant for readers’ responses to the quiz, shall ensure the spirit of friendly competition is kept alive, and knowledge is shared, sportingly! Team Samvad shall remain indebted to every member of the staff and student community, apart from the very bright students of various institutes of the country who have been instrumental in the making of this issue. We wish you an uplifting read! Keep reading and do write for us. Please send in your entries to : samvad.we@gmail.com. 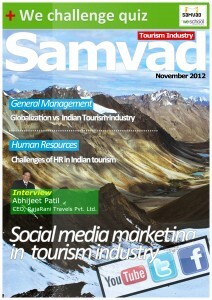 Follow Samvad on twitter on: @Samvad We.